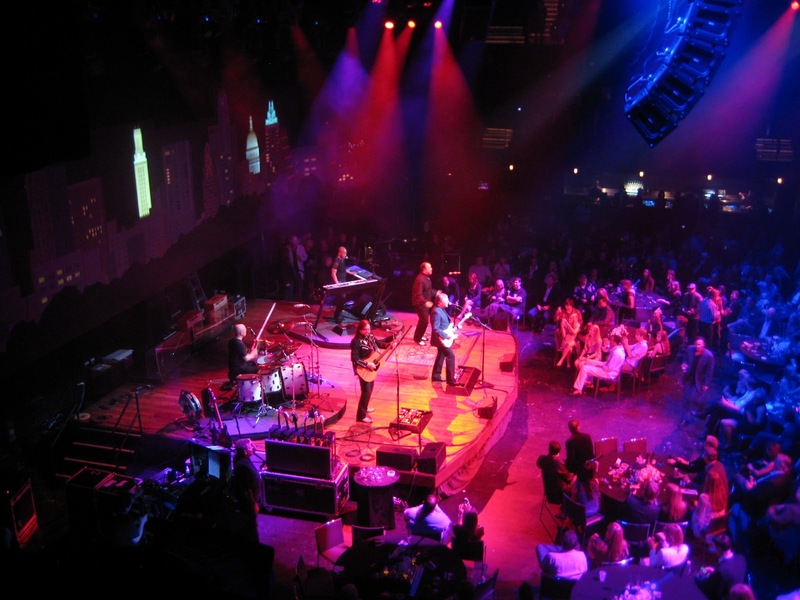 My birthday present to Bill was tickets to opening night of the new Austin City Limits stage at the Moody Theater. 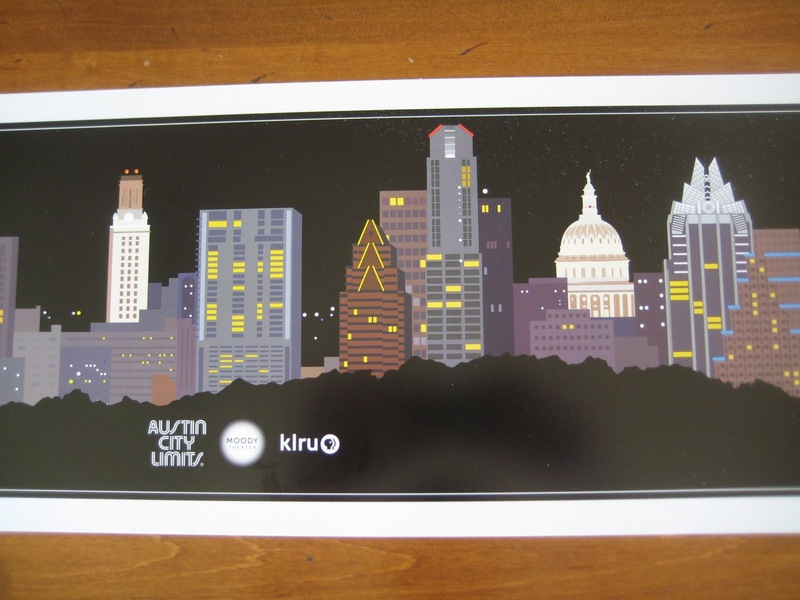 This evening was a fund raiser for the local PBS station, KLRU, which produces the Austin City Limits TV series. The ACL backdrop was unveiled at the start of the program. The scene is an updated view of the downtown Austin skyline from the same vantage point as the old backdrop. Downtown is not quite drawn to scale since the UT Tower and State Capitol are now dwarfed by the highrises. My photos of the actual backdrop don’t do it justice but you can get the idea from my photo of the poster above. Bill and I had first row balcony seats on the side near the stage. We liked this location better than our floor seats last week … no cowboy hats to block our view. This also gave us an opportunity to watch everyone who had arrived earlier for a catered dinner. 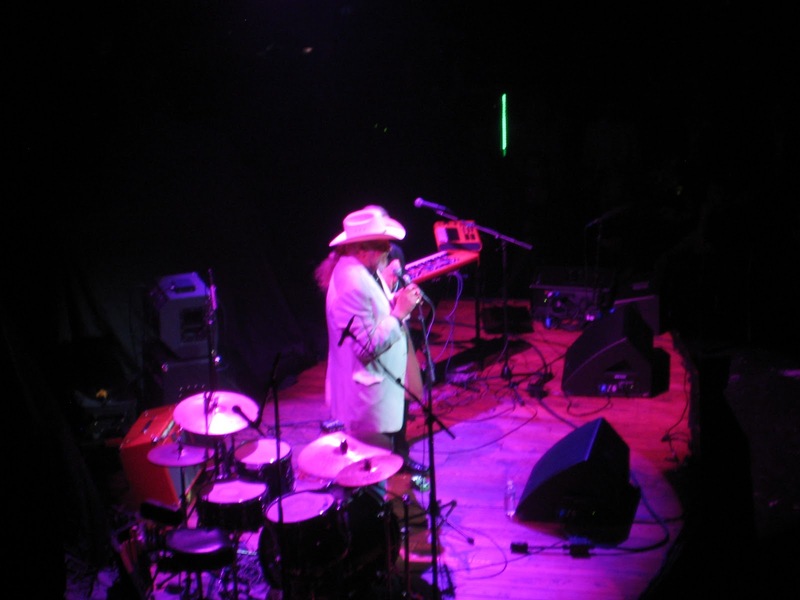 Local musican Ray Benson (minus Asleep at the Wheel) introduced the musicians. Carolyn Wonderland and her band played first. She reminds me of Janis Joplin, who I’ve always liked for obvious reasons. The evening was headlined by the Steve Miller Band. I didn’t realize that Steve Miller was such a good guitar player. They played a long set list (20+ songs) but did not come back on stage for an encore. 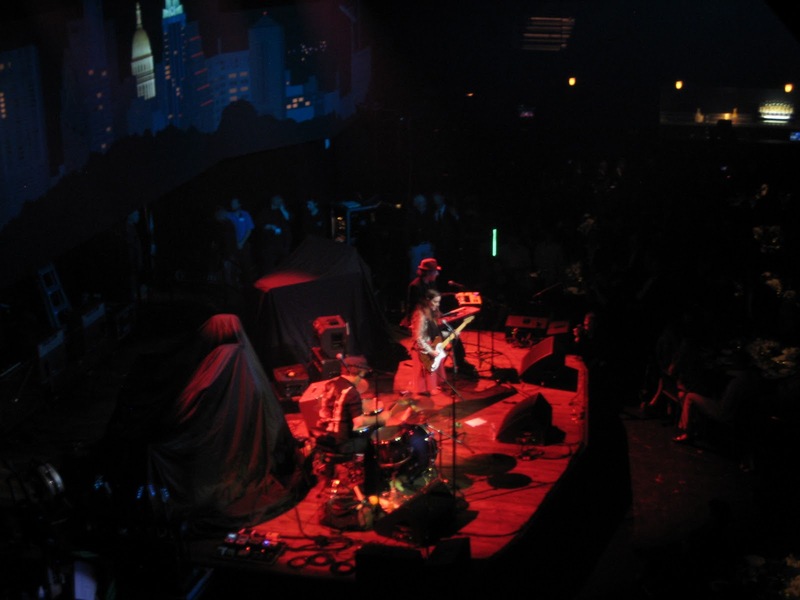 They played in Houston the following night and then came back to Austin to tape the first ACL TV show in the new theater. 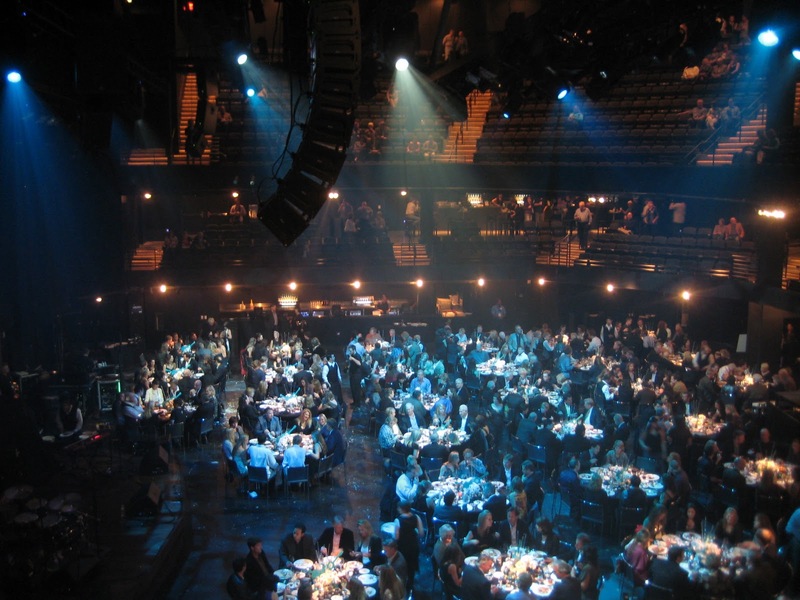 After the show, everyone was invited to wander around the Moody Theater. The mezzanine level has a gallery of photos from famous ACL performances. Except for maybe the first few rows on the floor, those mezzanine seats are the best in the house. 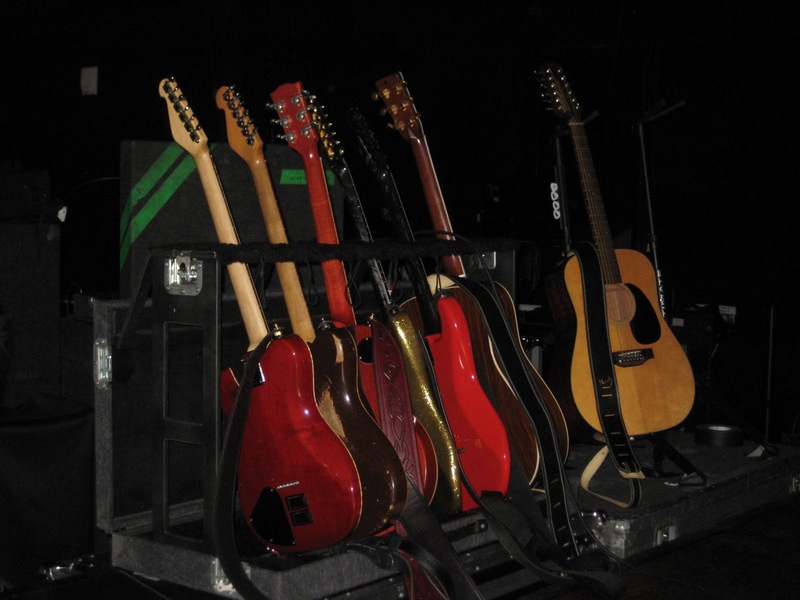 We also went up to the stage for a closeup view of Steve Miller’s many guitars (which he did play during the concert). What fun you guys are having. I remember the first ACL show I saw on TV – Canned Heat. I was 17. How much fun to have attended this event. Seems like you live in a different world now. I think I like it.